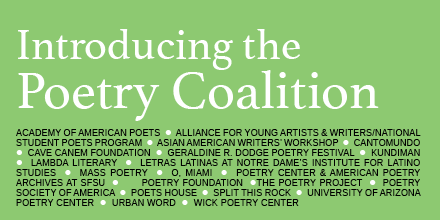 December 6, 2016—Twenty nonprofit poetry organizations from across the United States have formed a historic coalition dedicated to working together to promote the value poets bring to our culture and communities, and the important contribution poetry makes in the lives of people of all ages and backgrounds. Asian American Writers’ Workshop, a national community space and online magazine publisher, will award fellowships for emerging Muslim American writers to tell the stories of their communities, conduct front-line events and publish stories online featuring first and second generation immigrant writers, and hold Asian-language community arts events in Sunset Park, Brooklyn and Chinatown, Manhattan. Kundiman, a national organization promoting Asian American poets and writers, will collaborate with Split This Rock and Letras Latinas to host a joint reading featuring poets Wo Chan and Orlando Ricardo Menes on March 19 at Busboys and Poets in Washington, D.C. Kundiman fellows will also participate in a Migration Postcard Poem Project, for which they will design, write, and mail postcard poems highlighting the migration theme for their readers, both new and old, advocates and adversaries. Select poems on the theme of migration will be featured on the Kundiman website and social media channels. Letras Latinas, the literary initiative at the University of Notre Dame’s Institute for Latino Studies, is partnering with Notre Dame’s Creative Writing Program to hold a campus-wide event during the month that will feature students, faculty, and staff sharing poems around the theme of migration and in support of their DACA students. The Poetry Society of America, which launched Poetry in Motion placing poems in subways and busses, is planning an event at City Lights Bookstore in San Francisco about the Syrian refugee crisis. The University of Arizona Poetry Center in collaboration with the Poetry and Literature Center of the United States Library of Congress, will present multiple programs addressing overlaps between poetry and figurative and literal migration, including issues of translation, the private and public life of poetry, and poetry’s role in addressing human migration, borders, and cultural interplay. Programs will include a featured reading with United States Poet Laureate Juan Felipe Herrera and a panel discussion between him and Arizona Poet Laureate and Academy of American Poets Chancellor Alberto Ríos, moderated by Poetry and Literature Center Director Rob Casper at the Tucson Festival of Books.